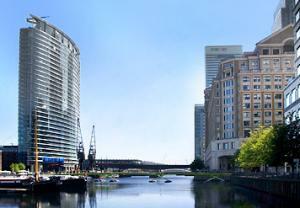 Rising above the vibrant Canary Wharf district and its captivating array of international business, chic shops, restaurants, pubs and wine bars, the 5 star London Marriott Hotel West India Quay mirrors the best of the preferred hotels in London. Located 11 minutes from London City Airport via public transport this landmark hotel offers an extraordinary blend of comfort and convenience that is in sync with its surroundings. Stylish guest rooms and suites have been smartly designed with work areas, high-speed Internet and lap top safe. To revive the body and soul, there’s a state-of-the-art fitness suite. And for a relaxing repast, Curve Restaurant & Bar tempts with fresh seafood and great steaks, situated amidst the largest al fresco dining in the area. The London Marriott Hotel West India Quay offers an ideal location with easy connections to ExCeL London, The O2, the celebrated theatre district, famed markets and popular West End attractions.